Kaleo Puou was on a fishing trip with his girlfriend Rene Penrose and fishing buddy Eric Perez when he hooked his dream ulua. 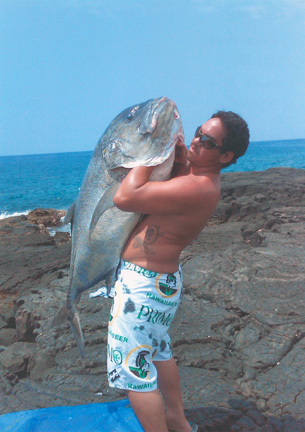 The huge fish engulfed a 2-foot-long eel bait that Kaleo had slid on his Daiwa Saltiga pole. Kaleo battled the fish using an extended Penn 6/0 reel that was loaded with 60- and 80-lb Berkley line.